Exquisite, newly renovated Shingle-Style Estate set on nearly two acres directly across from The Country Club. The main house includes splendid living and entertaining rooms, 7 bedrooms and 7 bathrooms. Brand new master suite features fireplaced bedroom, separate sitting room, lavish marble bath, and ample closet space. The Carriage House with 4-car garage features a separate 2-bedroom apartment. The home’s beautifully landscaped grounds were originally designed by the renowned firm of Frederick Law Olmsted and have been enhanced with a wrap-around porch, new patio terraces, and heated in-ground Gunite pool. Great privacy at a spectacular location in Brookline’s Estate Area. Sold for $6,732,000. Extraordinary dream home located in estate area of Brookline! Newly renovated stunning 6+ bedroom home has incredible detail- marble floors, handcarved crown molding and five one of a kind fireplaces. Five magnificent bedrooms all with ensuite full baths and an elegant master bedroom with his and hers closets, a private balcony and luxurious master bathroom. Gorgeous gourmet kitchen with granite counters, custom cabinetry and all new state of the art appliances. Spacious media room, home gym and large carriage house. Sold for $6,980,000. This Weston single-family home is set on 3.45 acres of land. The house, which has five bedrooms and nine bathrooms, was built in 2009 in the Cape Cod style. Sold for $7,300,000. Magnificent custom shingle style manor with highest attention to quality and detail throughout. Welcome to over 20,000 sq.ft of paradise and tranquility. Influenced by world travels, this impressive residence masterfully accentuates the finer things in life. Great hall with European inspired limestone fireplace, wide stairs set well away from the front entrance, Cooks kitchen and breakfast room with imported stone tile looks out over views of expansive lawns. Luxurious spa amenities; sauna, hot tub, two full baths surrounding a spectacular 61x39 indoor pool with abundant natural light, integrating outdoors all year round. Media room, billiards, exercise room, wine cellar and perfectly replicated 1950's ice cream parlor are sure to please the most discerning guests. Extreme privacy with close proximity to Boston and Hanscom, in an exclusive A+ Southside neighborhood. Truly one of kind. Sold for $9,125,800. This elegant Marlborough Street townhouse is in the process of a complete renovation. 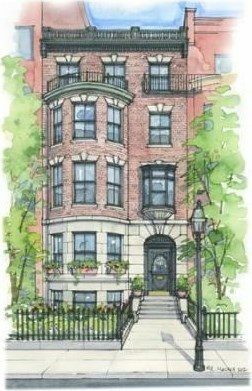 This home will offer many modern conveniences and all of the architectural appeal of historic Back Bay with beautiful moldings, seven gas fireplaces, dark wood floors and three bay windows overlooking Boston's most charming residential street. This five-plus bedroom home offers over 7,500 square feet of exceptional living space complete with elevator, walk out terrace, rear garden and garage parking. Additional features include grandly scaled entertaining rooms with dramatic details, open kitchen and family room, floor-through master suite, spacious study, au-pair suite/gym, a great room on the top floor, five full and two half baths. This wonderful family home is located right in the center of the Back Bay and the shops and restaurants of Newbury Street. Two garage parking and three outdoor spaces. Sold for $12,000,000.